New! Chipsockets added for safer soldering! for computer Brother knitting machine Model KH900 and KH 965. IMPORTANT US Customers: You cannot use the original brother power supply because of opposite polarity . This is an alternative pattern control with which you can send patterns to your knitting machine without designaknit or a ppd. Software is free. Hardware works in combination with an Arduino Uno Rev3. If you want to knit with 6 colours you can use black and white with 4 shades of grey in your design. Works on single and double bed. NOTE: the 10 pin connector is now angled as production of straight connectors has been terminated. After soldering and putting the shield onto the arduino you unplug the old hardware and plug in the new hardware. Changing back to your old hardware is no problem. I am selling the shield kit plus connectors and take no responsibility for any alterations by soldering or use etc. The shield was produced to the exact specifications from AYAB, see their website. Returns only after communication and if the kit was not altered. Tracking: Some destination countries (eg Canada) dont offer tracking, so tracking is only available until handover to that destination country. However some do offer tracking via destination postal system. Very well packaged, Fast delivery, Excellent seller communication, and help is available if you get stuck. As I'm not very experienced with electronics, I'm still having some technical difficulties but the seller has been brilliant at helping me along via email and I have hope that, when all is running smoothly, it will absolutely be worth it! Great product and service! 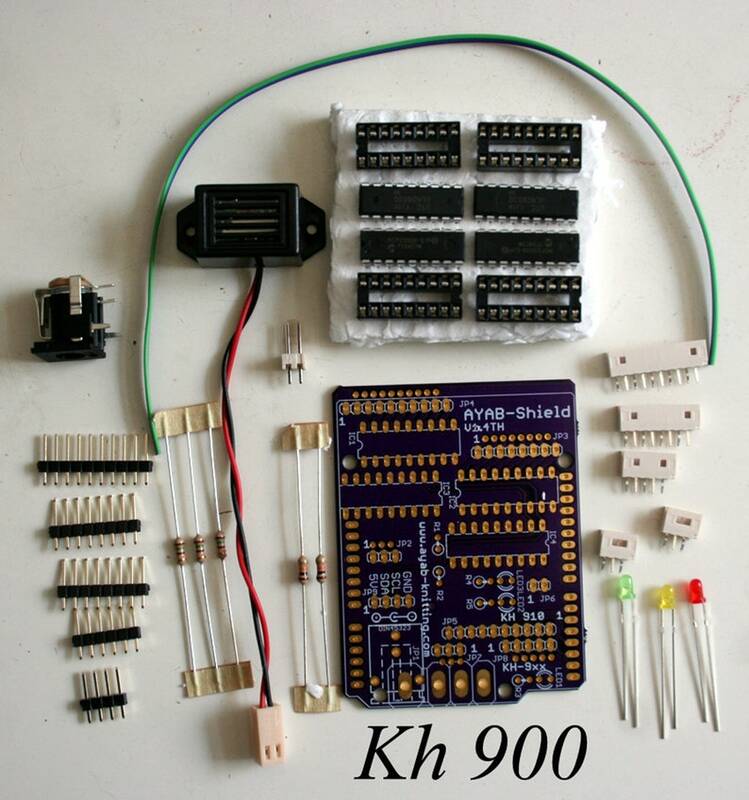 Note that the original AYAB soldering instructions do not cover the KH 900 shield at this time. You can follow most instructions but two pins are positioned different. Please ask shop owner for a picture of the assembled shield. She's very helpful! Arrived fast and was very well packed.